This week at Whimsical Wednesdays we want to see embossing on your projects . 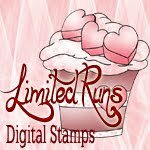 We are sponsored by "Limited Runs digital stamps"
This one is called cinnamon swirl . I have used an embossing folder from papermania and another from Tim Holtz and distressed the paper. I have used one of Stephanies Stamps on the tag. Some gorgeous liquid pearls . Coloured it with my copic pens. Added a small amount of lace and voila- Done . Do pop over to the main blog to check out what the rest of the DT have been up to. Fabulous card and design. Perfect choice of colors. I really like the embossing and they way you split it up on the card. Very nice inspiration!! Great card... I love that image. I wanted to pick that one but didn't and I wish I did. hehe!! Love the embossing folders you used and everything. Great Job. Beautiful card. I love the embossing folders you have. great cup! !